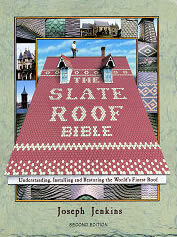 The Slate Roof Bible - Second Edition - Old World Distributors, Inc. The Slate Roof Bible - Everything You Wanted to Know About Slate Roofs Including How to Keep Them Alive for Centuries is the first book to be written on the subject of slate roofs since 1926. Published in1997, the 8½"x11" book has nearly 300 pages with 200 photos, both black and white and color, and an additional 175 line illustrations. It's two parts are separated by a section of color photos. The first half consists of general information about slate roofs, slate quarrying, slate roofing history and more. The second half of the book consists of a comprehensive repair and restoration mamual full of practical, illustrated , "how to" information.